Temple Lodging in Japan "Zimyo-in"
The front garden of eight-leaf laurel was created by Osamu Mori, a famous gardener in the Modern Age. It is a wooden temple with a calm atmosphere surrounded by a vast garden. There is a place to step on the sand gathered from the Shikoku 88 sacred spots. If you wish, you are able to receive a certificate of fulfilling this (for a fee). 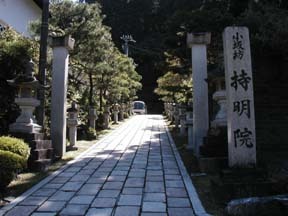 A guide service is provided for groups of 20 or more people for free (reservation required). The temple owns many Buddha statues and paintings, including a portrait of Oichi, who is the sister of Nobunaga Oda and the wife of Nagamasa Asai. You can also have alcoholic drinks. I stayed there at the end of the year, but there seemed to not be many guests. For this reason, the bath time for women was only until 20:00 because they opened only one bath on that day. But it became a good memory now. I hear that they open the bath longer when they have more guests. Although I reserved the cheapest room, they let me stay in the most gorgeous room. I think this is maybe because there were many vacant rooms. I felt so lucky! There were two sections in my room and I was glad to find a kotatsu heater. They served shojin vegetarian cuisine, which tasted very good. For dessert, a big slice of expensive melon was served. According to my friend, it could be from the parishioners of the temple as a year-end dedication. You can participate in the service, which starts at 7:00 in the morning. At 6:45, a priest will come to your room to invite you but you don't have to participate. Our duty in the service was to listen to the chanted sutra in the main hall. In the middle of the sutra, you are invited to offer incense. I was watching the person before me eager to know what to do. Bring something that looks like buckwheat husks close to your face once and then put it into a square box in the back? Twice? I wonder if it was right. Anyhow, the main hall was utterly dark and you cannot see the movement of the person just before you. You have to be careful. In any case, I recommend that you experience this exotic ritual. You may be a little scared when you go to the restroom at night, which is also a taste of Mount Koya. It is not dark, but you may be scared finding the Buddha statues (Ashura?). Basically, the spaces other than the rooms are extremely cold. Although the toilet seats are heated function, they cannot cope with the severe cold, so you have to be careful when you sit down. When it comes to the cold, only cold water is available from the tap in the room. Using this water for brushing your teeth numbs your mouth. Don't forget to add some warm water from the thermos. Also, as you may have free time at night. (You can use cell phones, but not PHS phones.) I recommend that you read the comic book called "Kukai" (about the founder of the Shingon sect of Buddhism) while watching television. It may not be interesting, but it will give you some knowledge. Also, the snow was pretty heavy on Mount Koya. If you visit in the winter, you should wear appropriate shoes.